What did you think about Hotel Arès Tour Eiffel’s location? The Hotel Arès Tour Eiffel is in a brilliant location, in a very quiet street in the busy La Motte Picquet district. There are coffee shops in the street and it’s perfect for walking everywhere, with easy access to transport too. There are three metro lines in the area to choose from and the bus tours from the Eiffel Tower are just a few minutes walk from the hotel. 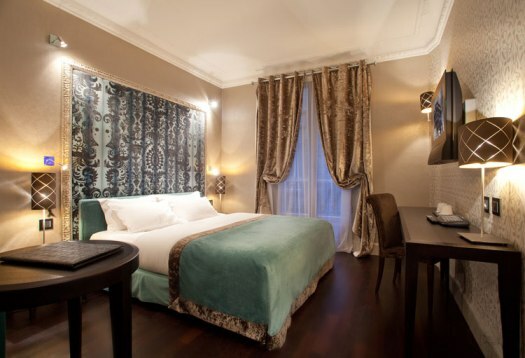 The hotel is a boutique hotel and our room was very luxurious, decorated in a mix of modern and Baroque style. The bed was extremely comfortable and the bathroom was gorgeous, with a massive shower and Hermès toiletries. The room was air-conditioned and we had free Wi-Fi, which was a bonus. How did you find the service? The service was excellent with friendly staff who spoke very good English. We arrived very late (straight from our wedding!) and there was actually a leak in the ceiling near the door of our room. The room was changed for us straight away without any fuss. The hotel organised a taxi back to the airport for us and looked after our luggage until our departure. Would you recommend this hotel to others? Absolutely! We would go back again and definitely recommend it to others. It’s in such a good location and it really is a special stay for couples. What ‘things-to-do’ would you recommend? We only had a few days in Paris and the hop-on, hop-off bus tour was a great way for us to see the city and get ourselves orientated quickly. A highlight was the lovely dinner cruise on the Seine, which took you passed the Eiffel Tower, Notre Dame, etc. and we would really recommend going up the Eiffel Tower in the evening, when it’s not so busy…the city lights are beautiful! Visiting Paris with children? You may also be interested in: 5 Top Tips for Paris with young children. This entry was posted in Reviewed by YHP contributor and tagged boutique hotel, luxury hotel, Paris. Bookmark the permalink.